In an environment there are many resources which all living things in it want. They must struggle to gain these resources and this is called competition. It is this that drives natural selection as organisms must constanly adapt so that they can compete against other species better. If the prey population increases, there is more food for the predators so their numbers increase. More prey are eaten, and so their numbers decrease. Predator numbers fall because there is not enough food. 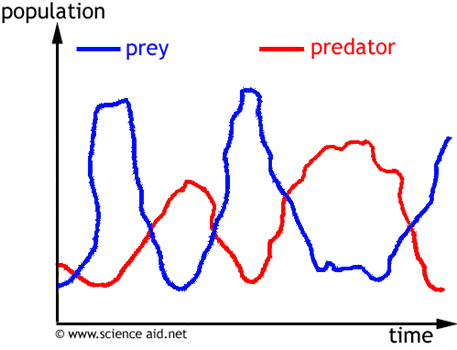 If the predator numbers are falling, the prey will become more numerous because they are not being eaten as much.